This is the Haula Cowl! I recently got some Brava yarn from Knit Picks to review. I felt inspired so I decided to make a little cowl out of it. 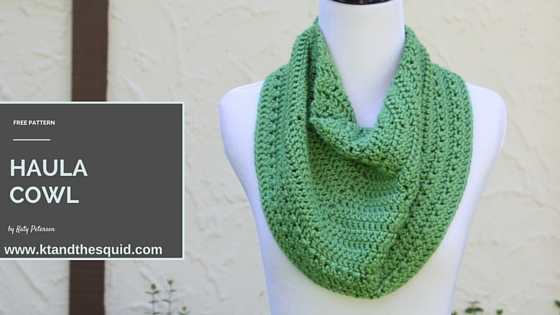 The great thing about this cowl is it only takes one skein! That’s about 218 yards. It’s also really quick. I made mine in one evening! The pattern is just one size but you could easily pick up another skein and add more bulk if you wanted. You can view this pattern below for FREE or if you like to print your patterns you can purchase a printable PDF. Click HERE to add this pattern to your Ravelry queue. I just love these cowl/shawl hybrids. The have all the bulk in the front but less in the back so you look less like a hunch back. It’s a really fun shape to play with! 20″ opening at the top, 35″ opening at the bottom, 12″ tall in the front. Please read all instructions before beginning. This cowl is worked flat for the first 18 rows and then in the round for the remaining rounds. You will now start working in the round, remove all stitch markers. Round 3: Repeat round 1. Round 5: Repeat round 1. You can repeat round 2 and 1 more times if you’d like a larger cowl. Fasten off, block, weave in ends.